Certifications ensure high standards of quality and compliance with quality assurance. It goes without saying that we meet these standards. 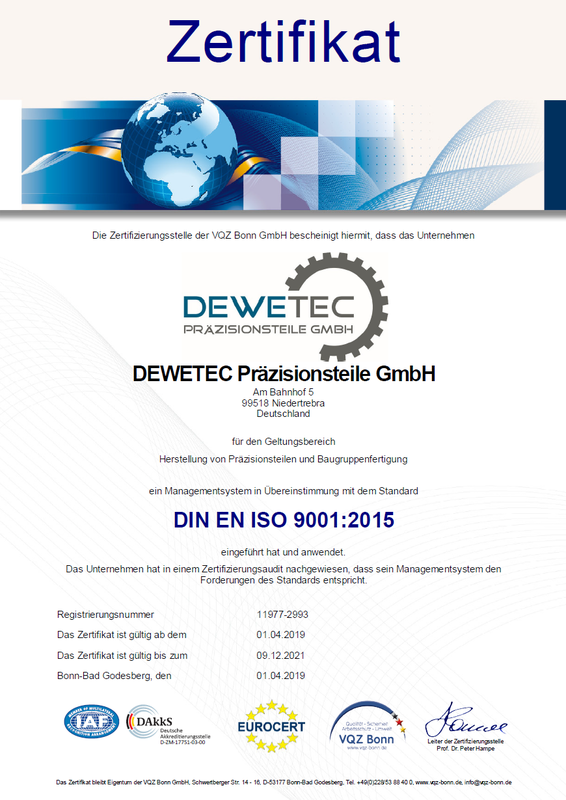 Our company is certified in accordance with DIN EN ISO 9001 : 2015. However, the highest standards for perfection and precision are those that we require of ourselves. This is the only way for us to achieve 100% customer satisfaction and maintain long-term business relationships. We understand and respect our customers' expectations for perfect products, on-schedule delivery, cost-effective production and innovative solutions. Therefore, this idea is part of our corporate philosophy; it defines our daily actions. Our customers confirm that we are a high-quality supplier – with follow-up orders. This distinction reflects our standards better than an external inspection certificate – and keeps us motivated. Werner Dreh- und Frästechnik technology is your specialist for the production of small series. Die Keil Feinmechanik GmbH bietet unter anderem CNC-Fertigung von Drehteilen und Bauelementen aus Stählen, Gusswerkstoffen, NE-Metallen und Kunststoffen.